A generous soul, this tooth fairy! “Well I don’t want her wings to get wet and then wake up to a fairy dead next to my bed” Indeed no. “I want to clean it – it’s nowhere near as clean as the rest of my teeth.” And it isn’t. Over the last 5 years it has steadily turned from white, to paper coloured, to a slight grey. 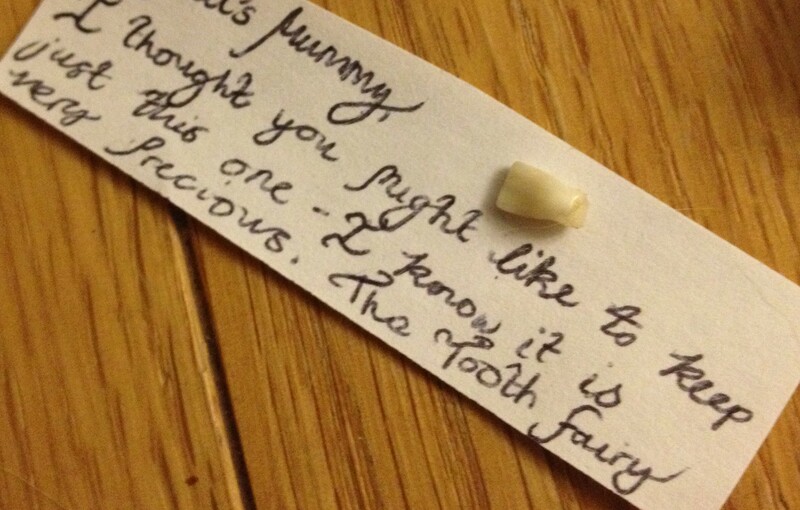 It’s all been about teeth this week in our house, the big boy has had a visit from the tooth fairy and the baby has been cutting no less than 8 Lego bricks (teething advice welcome – I’ve never had a teether!). This is the third tooth he’s lost so he’s quite blasé about it – dead fairy fears aside of course – but I feel more sentimental about this one than any other. “Let’s just hope he’s not going to be like she was…” I was familiar with this story, the our-daughter-the-terrible-teether story. It’s haunted me for the last 31 years. Luckily he wasn’t, he had the odd day like I’ve described, but the week he turned 6 months a tiny tooth popped up without us even noticing – and that’s how it was for his first sister too. Lucky eh? Don’t worry… as you should know by now my smugness always comes back to haunt me! I’ve mentioned before that I was always worrying about the boy, this is because when he had just turned one, he started the wobbly walking (into furniture often, into door frames, table corners – you name it), he fell off a bed and got himself a cracking black eye under my watch – I was a wreck. Our perfect, flawless little bundle was looking battle scarred. And it was all my fault! I quickly learned I couldn’t catch him every time and he developed a terrifying habit of trying to literally run before he could walk properly. The day it happened, we had both been at work, we were tired and distracted, talking about something completely inconsequential and not properly watching him. We heard him fall over no more than 3 feet in front of us both, a wobble and a sit-down-thud onto his bottom. The fall certainly didn’t hurt him, or it wouldn’t have if he hadn’t bashed his tooth on the way down. One gaping hole and gushes of blood (crikey, they bleed lots when they hurt their mouths!) no tooth, the upper right front tooth was gone. “What do you mean it’s gone? !” (My husband has the most annoying endearing way of dealing with a crisis, simply repeating back to me in an accusatory fashion with what do you mean attached to the beginning. He does it all the time.) Anyway, we went to the minor injuries unit, where they checked him over, otherwise totally unscathed, and we came home soon after with our gappy boy tooth – nowhere to be seen, presumed swallowed. Gutted. Facing the next 5 or 6 years with a gaping hole in his jaw was the prognosis. There was nothing wrong with him, he wasn’t scarred, he was managing perfectly fine… but I was wracked with guilt. Feet away from him and I hadn’t caught him. It stays with me even now, terrible mother – which I had to broadcast all the time when people asked what had happened to his tooth. He beckoned me over and we looked in his little mouth: sure enough, his little tooth was back up in his gums, about to emerge for the second time. In his fall, he had bashed his tooth so hard it had been pushed so far back into his gum, there was nothing but a great bleeding hole. So he had a tooth, it had a tiny chip and faded over time but it was there! Losing that tooth on Friday, I felt very grateful for a number of reasons. Grateful that we’d had 4 and a half years of a tooth to enjoy, grateful I no longer have to look at him swinging it out of his mouth on its last hinges like he has done for the past week (I cannot bear a wobbly tooth!) and grateful that he doesn’t remember the trauma attached to this one, or the significance of it. My husband made a call to the tooth fairy last night, to ask if I could keep this one, to stick in his baby book and as luck would have it – she said I could. Wouldn’t worry about your failure to catch him, nothing to do with being a failure as a Mother – there was many a ball you failed to catch/ notice!!! It is Catching where the problem lies!!! Love that he was worried about getting the tooth fairy’s wings getting wet, looking after people again.